I had recently posted on the good announcement of Chief Minister J Jayalalithaa that Tamil Nadu will be a power-cut free State from June 1 and all restrictions imposed on power supply by the previous DMK regime in 2008 would be withdrawn from that day. Conservation of energy has been a pet topic for long …. and remember the ‘gundu bulb’ – before we read any further, the light bulbs that were in use earlier had vacuum and once punctured, they will not function – in fact would break into pieces. An incandescent light bulb, is an electric light which produces light with a wire filament heated to a high temperature by an electric current passing through it, until it glows. 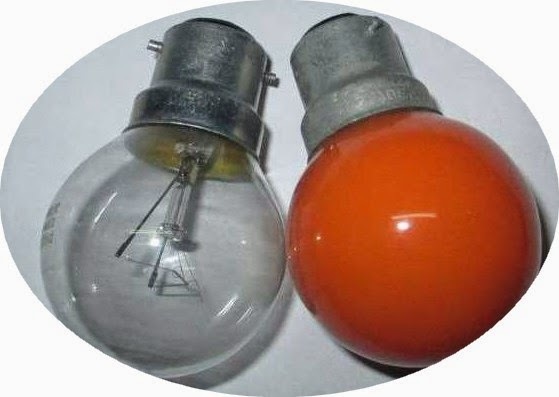 The hot filament is protected from oxidation with a glass or quartz bulb that is filled with inert gas or evacuated. The light bulb is supplied with electrical current by feed-through terminals or wires embedded in the glass. Most bulbs are used in a socket which provides mechanical support and electrical connections. One of the problems of the standard electric light bulb is evaporation of the filament. In a conventional lamp, the evaporated tungsten eventually condenses on the inner surface of the glass envelope, darkening it. For bulbs that contain a vacuum, the darkening is uniform across the entire surface of the envelope. Can you imagine opening a bulb ? - and it still functioning later... ?!?!? Then came the theory that one should use only CFL – the compact fluorescent light bulb, as its illumination comes by way of a much different mechanism. Instead of a glowing filament, CFLs contain argon and mercury vapor housed within a spiral-shaped tube. CFL would use only one-fifth to one-third the electric power, and last eight to fifteen times longer. A CFL has a higher purchase price than an incandescent lamp, but can save over five times its purchase price in electricity costs over the lamp's lifetime, is what was claimed. 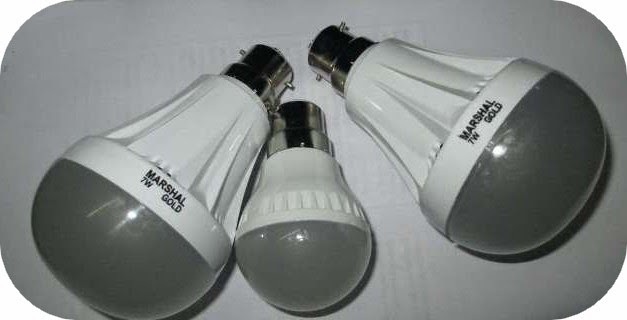 It was further stated that many of the 60-watt electric bulbs brands in India do not conform to norms and specifications of the Bureau of Indian Standards (BIS). Consumer Education and Research Society (CERS) reportedly surveyed 60-Watt electric bulbs of 16 brands and found brands to fail in some aspects. The once ubiquitous 60W light bulb is already on the way out as many units in Europe have stopped production. 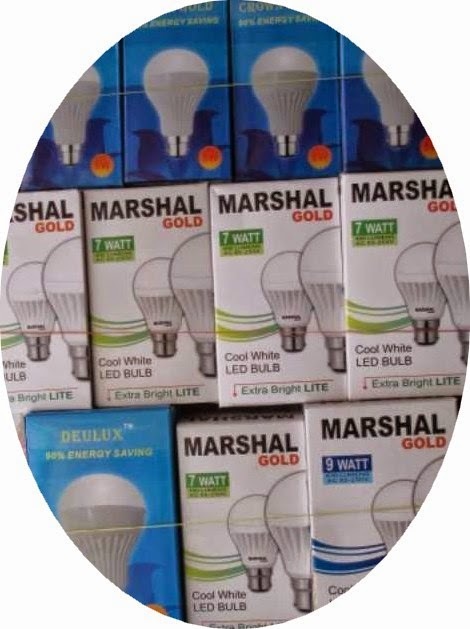 The 60W has long been the bulb of choice for the modestly-sized rooms in the typical Indian homes – not any longer as people have shifted to energy-saving light bulbs – again the market is flooded low cost, low quality Chinese and Korean brands. The Indian brands cost much, come with a guarantee – but many seemingly settle for the lower price. Away from traditional bulb and CFL – there are now LED lamps – that can be opened on top ….and interesting patterns observed …. 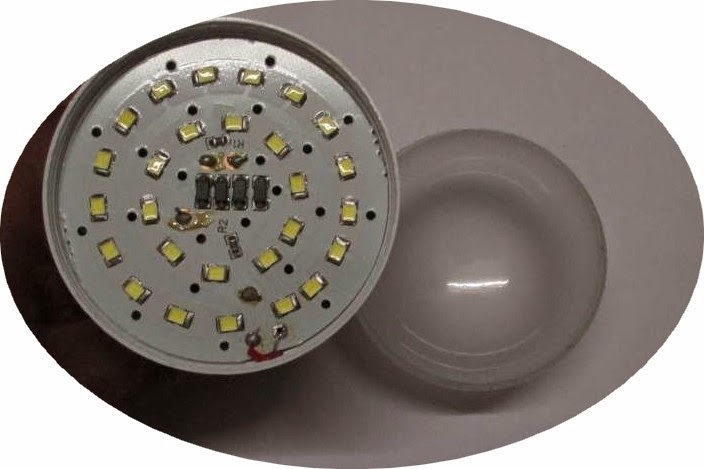 An LED lamp is a light-emitting diode (LED) product that is assembled into a lamp for use in lighting fixtures. 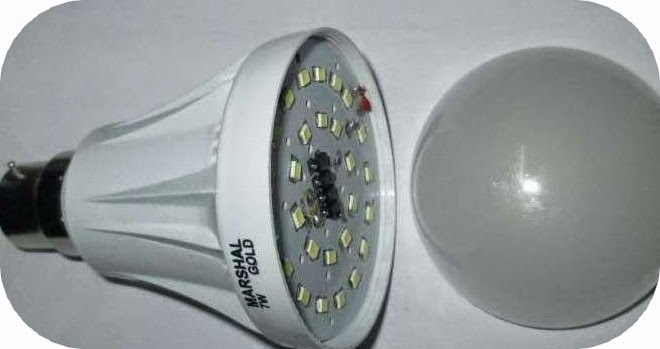 LED lamps have a lifespan and electrical efficiency that is several times better than incandescent lamps, and significantly better than most fluorescent lamps, with some chips able to emit more than 100 lumens per watt. The LED lamp market is projected to grow more than 12-fold over the next decade. Like incandescent lamps and unlike most fluorescent lamps, LED lights come to full brightness without need for a warm-up time; the life of fluorescent lighting is also reduced by frequent switching on and off.